First and foremost, one reason you might want an evaporative cooler is simply that they are less expensvie. From installation to maintenance, they just cost less. This is mainly due to the fact that their primary operations are centered around the use of a pump and a water pad. No fans, no motors, no refrigerant, no compressor … Just a pump. 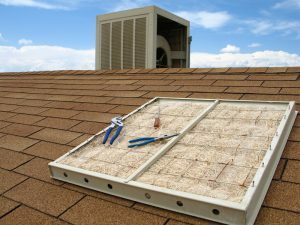 Installation is often the most expensive thing to consider with central air and heat pumps, but swamp cooler installation costs are greatly reduced due to being less complex. Fewer mechanical parts also means less broken parts, and that means not having to call in for air conditioning services in Naples, FL as much. Maintenance involves fixing or replacing the pump and cleaning the water pad of mold and mildew. Evaporative coolers work by taking advantage of the cooling effect that happens when air moves over water. The system pulls in air, passes it over a series of dampened pads, and then blows that cooled air through your ventilation system. Fresher Air: Essentially what’s happening is air from the outdoors is being converted into cooler air. This means that you’re constantly pulling in new air. Refrigerant based systems recycle the same air over and over, and it can start to get stale. Built-In Humidifier: Depending on certain conditions, this could be a blessing or a curse. If you struggle with dryness during the hot season, then the swamp cooler will be able to pleasantly raise the amount of moisture in your home. Alternatively, if humidity is a problem you struggle with, then this system may not be for you. Eco-Friendly: There’s a lot of debate about how air conditioners affect the environment and global warming. If you have any type of concern that your purchase of an air conditioner is going to cause environmental damage, you can put those fears aside when you go with an evaporative cooler. As mentioned above, swamp coolers don’t rely on the same operational practices that a refrigerant-based AC does. For example, that means you can leave your doors and windows open and it won’t compromise the effectiveness of the system. Plus, general concerns about air quality can be put to rest since you don’t have to worry about the same old air circulating through the home. Is an evaporative cooler right for you? We can help you find out. Contact Bruno Total Home Performance today to schedule service.